No batteries or caps are required. Most people know the iconic firearm of the Prohibition era as a Tommy Gun, although it’s more properly known as a Thompson submachine gun, after its inventor John T. Thompson. “Tommy gun” is far from its only nickname, though, and nowhere near its most colorful. It’s been called a lot of things over the years, including “The Chicago Typewriter,” “The Trench Sweeper,” and, most straightforwardly, “The Annihilator.” The general thrust seems to be that this is a gun that can shoot an awful lot of things in a very short period of time. If you need a lot of things shot quickly, that’s probably about as much as you can ask for. Of course, you’re not going to be shooting anything with this particular Tommy Gun. 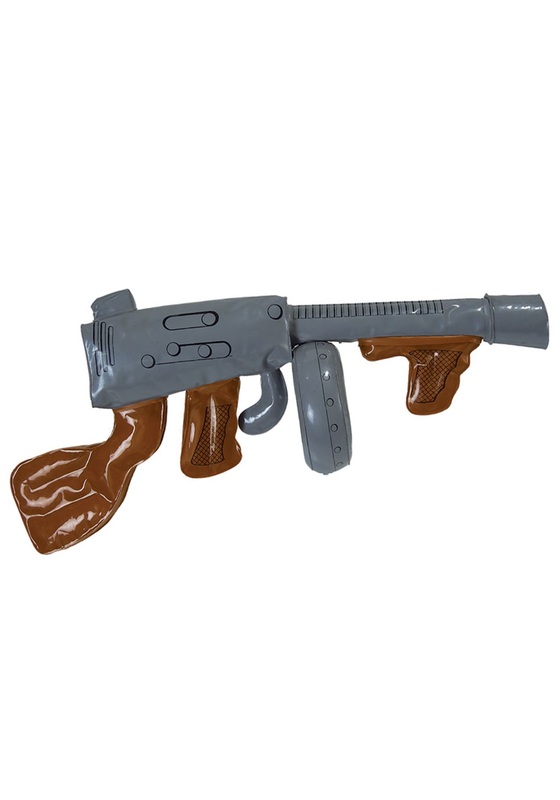 This fully inflatable firearm is straight out of an old cartoon where all of the gangsters wear brightly colored suits and talk in a bad Edward G. Robinson impression. But that’s OK, you’re only a costume gangster. The mean streets are probably that much safer with your inflatable armory out on patrol. This is probably a much more adorable show of firepower than old John T. Thompson ever imagined, but we’d be no one at the costume party will be complaining about that.